I was showing Stan the Electric Sheep screensaver today. Electric Sheep is taken from the novel “Do Androids Dream of Electric Sheep” which the movie “Blade Runner” was adapted from. Stan then turned it around on itself and asked if dreams are our screensavers, and without dreams, we would have the same image burned into our minds all the time, the way an image would burn itself into an old CRT monitor? Do those who do not dream tend to be more obsessed and single minded than those who do? I was in some sort of old school building, which was a very tall building. I had to run up the stair wells as exercise like I was in some high school gym class. This was not fun, but I was doing the stairs anyway. When I reached the top of the building there were two guys playing a piano together like they were having fun more than making music seriously. Tim was sitting next to them smoking a cigarette. He was having a good time talking with the guys and said hi to me as I ran past. I was thinking wait, why am I still running – I should go talk with Tim, then I woke up. I had a very odd dream last night. I don’t know how to describe this…it seemed as if maybe I was in someone else’s dream rather than my own. I don’t mean that the dream was crazy and atypical for me with a foreign subject matter. I mean I was actually present in someone else’s dream while they were dreaming it…I wasn’t having a dream, someone else was, and I met them in both of our dream-states. It had a strange dark fogginess to it. You know how when you dream, dreams seem so real. Not this one. It seemed like someone used a filter over it. It was like I entered the dream from the back entrance. I guess that is what would happen if you weren’t the one doing the dreaming, but were a subject in a dream. You’d enter from backstage rather than the front of the theatre…so to speak. Stan and I were in a church…pretty similar to the one where Tim’s funeral was. I have a history of church dreams where I dream I am in a church and I realize “I don’t have to be here. I can leave right now.” And I leave and feel wonderful. But it wasn’t me feeling out of place–that’s not to say I enjoyed being there, but I was there telling another woman “You can leave…you don’t have to be here. You’re an adult…you can walk out right now.” I was guiding her…I was…an atheist spiritual guide! Ha! What an oxymoron…but it’s like I was. I don’t know who the woman was…someone who was confused about spirituality…conflicted with her upbringing vs. what she actually believed…or didn’t believe. In the dream she actually did start to leave, and she was telling me, yes, I was right…she can leave, and it feels great! Mugsy “Pretty Boy” Ryan will give the response to the SOTU tonight. Hooboy. Another embarrassment from Wisconsin, right (yes, RIGHT, as in Wing) alongside Scotty The Boxer Walker. Whatever happened to the Progressive Dream? Mugsy looks like he’s right out of a 30s gangster flick. Could’ve starred in “Public Enemies” but they probably didn’t want to make it look too real. But how ’bout ‘dem Packers? Ya, you betcha. Anyway, I was thinking last night about mental illness…(speaking of whacko wingnut politicos)…But seriously. Last night as I was dozing off I was in that state where you’re still awake but you start to dream. You are not asleep, at least not totally. Part of your mind is still awake, yet the other part is starting to dream. It’s a strange netherworld. And it got me thinking…what if schizophrenia is actually just a condition where you can dream while awake? Have psychiatrists explored this theory? I have some pretty crazy dreams, and if I experienced them while awake, I would no doubt be labeled as schizophrenic. But because I can say “I dreamt that”, I’m just a person who has vivid dreams…and one who can remember them as well. I also sometimes talk or scream or shout or cry or flail about while dreaming. My grandfather, my mom’s dad, actually would sleepwalk. He was under a lot of stress at his job during WWII, and one time he got up at night, grabbed a kitchen pot, and waited at the back door for someone to come through it so he could bonk them on the head. That’s the story, anyway. I’ve never sleepwalked…just talked and shouted a lot. As of late, I mostly just cry and flail, with an occasional yell at very inappropriate times. (Like when I yelled “Just kill me now” because I was having a bad dream about my parents while Stan and I were staying at a family-run motel in Batavia, New York) My father used to yell and talk in his sleep, so if there is a genetic component for it, I probably got it from both sides. If it is somehow a “learned” behavior, then I only got it from my dad. Now if sleepwalking/talking/outwardly expressive dreaming is either created by nature or nurture, (as opposed to it occurring spontaneously due to stressors or something external), then it is understood within a culture. If there is no expressive dreaming within a culture because there is either no genetic component or behavior to pattern after, and someone from that culture were to encounter someone who sleepwalked/talked, would they not think that person mad? Just wondering. Would be a question for Psychology 101, but I’d have to time travel back 30 years or so. Last night I dreamt Jasper was playing with a mouse. Now IRL I would never let my animals play with a live animal. But I was allowing it in the dream. The mouse was about 3 inches long, not including the tail. It was pink and hardly had any fur. Apollo later joined in on the fun. Jasper was pretty gentle with it, but Apollo finished killing it off. It was sad, and I felt bad that I had let them kill it. A couple weeks ago, Jasper’s ears started becoming a little more erect. His right ear was the first to stand up, although the tip bent backwards. His left ear was a little slower. I was wondering if it was ever going to stand up, or if it would always flop forward like a puppy. I know I went through the same thing with Plato when he was that age, and he made it through that “awkward ear stage” just fine. A few days ago, Jasper’s left ear finally decided to stay up. But his right ear hasn’t changed. I am now wondering if it will be permanently bent backwards. I’m hoping he’s just at that awkward stage. The picture above I took of Jasper today. The picture to the left is of Plato when he was about the same age or probably a little older. Sometimes Jasper looks nothing like Plato, but the picture above reminded me of him so much. Little mannerisms, like when he does the spastic paws in the air thing is so Plato. Different personalities, though. Jasper is incredibly well-behaved around people, only barks when he is playing with other pets. I don’t remember Plato being as spastic, though. Was he? Or am I just getting old? I dreamt that Stan and I went to Milwaukee together. We’re doing that manner of locomotion that only occurs in dreams where it’s like you’re driving because you’re gong fast, but you’re free of any physical restraints or boundaries that a car would put on you. We’re whizzing by houses and see some old school or something that was converted into public housing. We stop there and Stan and I go inside. I’m afraid we’d be hassled because we’re strangers who don’t live there. The building is very stark, concrete and industrial. We climb up some steps and Stan sees a poster for some church service and says he wants to stop by. He says it had something to do with “some little girls in the news.” (huh?) Reluctantly, I follow him, but we can’t find the door…they all look the same. Then we descend the stairs. The concrete stairs are very steep and the handrail is made of old iron pipe. Stan is walking fast and I’m having a hard time keeping up. Then he sees someone he knows, some guy in his 20s…light olive skin, black shaggy hair (probably dyed black) and brown eyes. He has a body modification style ear…it’s like a pierced ear with a large plug, but it’s not hanging down, it’s covering his entire ear. The decoration is like a hubcap. Hard to explain how the skin of the ear wraps around it. We sit down on the concrete steps and Stan is talking to this guy. Then Stan says we’re going to stay at a certain hotel for the night, but it’s not a recognizable name of a hotel/motel chain, so I fear it’s a seedy pit. I didn’t like this situation at all. I’ve been too busy to write down my dreams lately, but here’s a few excerpts from what I remember over the past week or so. Stan and I were driving to a large city at night…either Denver or Milwaukee. It was snowing hard and we were exiting off an interstate ramp. We were both in the backseat and Stan was driving from there. The hood of the car was high and with the combination of the night and snow, I couldn’t see where we were going. It was frightening. I think we ended up in some public building…can’t remember the rest. But I think the same night/different dream I dreamt I was driving/biking/walking up a hill near Midvale and traffic kept coming downhill towards me in my lane. I kept dodging cars, but then a yellow school bus came down towards me in my lane, and I had no choice except to turn off into a side street to avoid it. Unfortunately, the bus decided to turn onto that side street as well. I kept trying to dodge it, but it became inevitable that the bus would hit me, and there was no where else to turn because the sidestreet was a bridge. I lay down on the ground, knowing that I will get run over. The bus runs me over, but I don’t feel anything. I’m quite surprised it didn’t hurt. Then I woke up. I took Jasper out for a walk on a leash and was holding him between my legs because I couldn’t hold the leash for some reason. I think I was in Fort Collins, but wasn’t sure. Then I see this dog running down the street and I am terrified that cars will hit it. 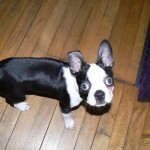 It starts to run my direction and I see it is a Boston Terrier that is fully grown and has a leash attached. 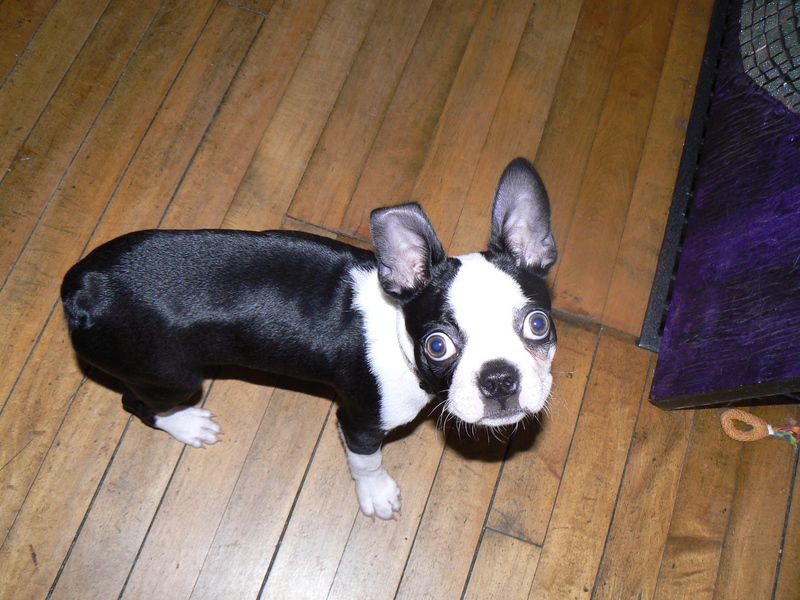 I grab it, and then wonder what I will do with two Boston Terriers. Then I look and see that Jasper is gone, and I realize the Boston I caught is Jasper. I also remember hiding out inside an unoccupied doctor’s office early in the morning at the Monona Clinic because I was waiting for something to open. I was trying to not be seen by any personnel who might be there. The office, which was more like an administrative or clerical office as opposed to physician/patient office opened directly to the outside, much unlike actual claustrophobic windowless hermetically sealed doctor’s offices. IRL Stan was getting ready to take a shower this morning before he went to work and I was still asleep. I dreamt that he was actually getting ready to shave his head. I told him not to do it, but he went ahead and started attacking his hair with a disposable razor. I kept demanding that he stopped, and finally he listened to me. Strangely, his hair turned out ok…it was shorter like the way he had it in the 80s. No Buddhist Monk stylings or anything, no hack job. I did have to trim a little, however. I had started crying my eyes out over a month ago when Plato first showed signs of going downhill quickly. I was preparing for that day for a while, yet it always comes too soon, and Stan and I wish we could both hold him just one last time. However if we had that last time, we’d always want one more last time after that. I keep thinking of all these things to write down, short remembrances of him, like the day we brought him home, and when he (and we) discovered beds and how he was “good in bed” (he just lied down and slept, unlike our then-pug, Hieronymus, who would chase around on them and do a bad doggy potty thing). I remembered when we travelled with Plato when he was still just a few months old to go to Stan’s Dad’s funeral, and then when he was about a year old to go up north to the UP to see the Paulding lights. I remember a photo of him with Hieronymus and a gigantic mushroom. I remember his silly tricks like “go get the hair tie”, and how he would spin around on the futon and stop and stare at my paintings on the wall, as if the metallic cosmos-like reflections did something to his imagination. I remembered how up until recently he would snuggle with me and Lucifer Sam on my futon under a blanket in the middle of the day. I remember so many things, too many to recount. In the early morning of Thursday, May 27, 2010, I awoke to a horrible dream. I dreamt that Stan had a bunch of blue crushed up crystals that looked like Azurite. But I knew what it was, it was Cyanide. He said that we could take it because life had gotten horrible. At that moment, this strange feeling swept through my body, still dreaming, and I started to see our situation from a strange and scary perspective. I did not want to die, yet I was frightened that Stan thought it was so awful. I told him no, I was not ready, that if I was in terrible physical pain I would consider it, but not now. I woke up and cried my eyes out. That night we had put Plato upstairs in the air-conditioning to try to calm him and cool him, yet he still barked all night. Stan slept with earplugs. I could still hear him. Early in the morning when Stan got up for the early shift, I recounted my dream, and tried to get him to stay home. See, I’m an oracle. Oracles speak in strange words and images that don’t always make sense. He went to work anyway. Plato would not settle down that morning. He was constantly asking me to take him outside to relieve himself, he was constantly panting from pain. He was maxed out on the highest dose our vet allowed us to give him of the painkillers. Even though he had regained his appetite a bit and was eating regular dog food and his poo was more normal-looking, he was crying in pain more and more when one tried to pick him up because he could not lift himself up. Stan called from work and we discussed it. We realized he was trying to tell us he wanted to go…it was time. He made an appointment with the vet for later that afternoon, and around 2:45-3:00 pm he left this world.